When I gradated with my BS in computer science from Brigham Young University in 1978, we had roughly 120 undergraduate students in the CS program. When I came back to teach in 1985 — just seven years later — there were over 1,000 undergraduate students in the program, and you actually had to apply to the CS program and be accepted in order to major in computer science. Not surprisingly, the dot.com craze of the late 1990s triggered another explosion in computer science enrollment and degrees, clearly shown on the table above. What is not shown on the table above is that the Great Tech Crash of 2000 significantly depressed the job market for students graduating in the 2000-2004 timeframe. After seven years of declines, the number of new CS majors in fall 2007 was half of what it was in fall 2000 (15,958 versus 7,915). Nevertheless, the number of new majors was flat in 2006 and slightly increased in 2007. This might indicate that interest is stabilizing. 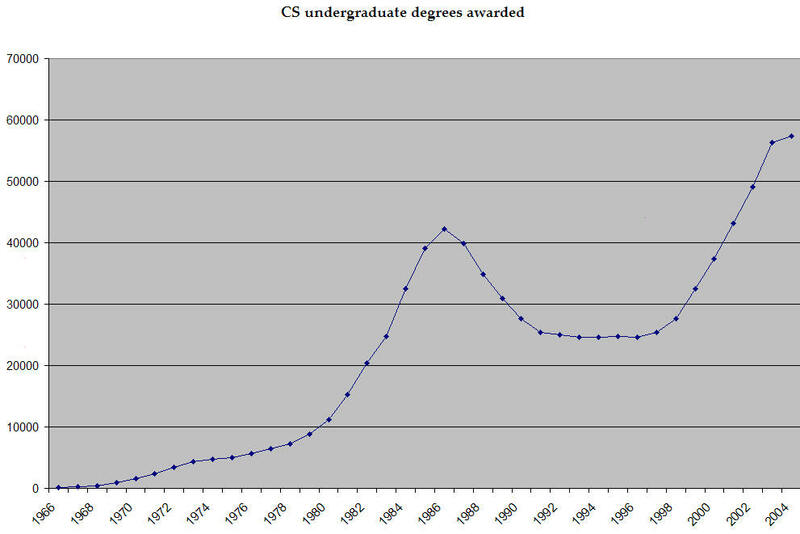 The decrease in new majors has meant that the number of students enrolled in CS has fallen for several years (Figure 2). Between 2005/2006 and 2006/2007, enrollments went down 18 percent to 28,675. Overall, enrollments dropped 49 percent from their height in 2001/2002, while the median number of students enrolled in each department fell 53 percent since 2000/2001. The NSA data only goes up to 2004, so it doesn’t reflect the corresponding decline in CS degrees awarded — that won’t start showing up until 2005. But the second table above shows how closely enrollments and degrees track (when time-shifted by 4 years). In my next post, I’ll talk about what I believe are some of the factors that cause these up-and-down trends in CS enrollment and degrees. ..bruce..